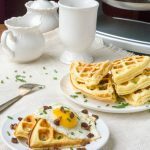 These Savory Cloud Bread Cheddar Waffles are keto, low carb, grain free and gluten free using my Cloud Bread recipe for the batter! When you start with a good breakfast, the rest of the day seems to go just as well. 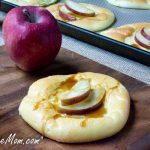 These are perfect for busy Back-to-School mornings because they can be made ahead and stored in the fridge for easy heating, grabbing and going! Super Easy, Tasty, Low Carb Cloud Bread Waffles! 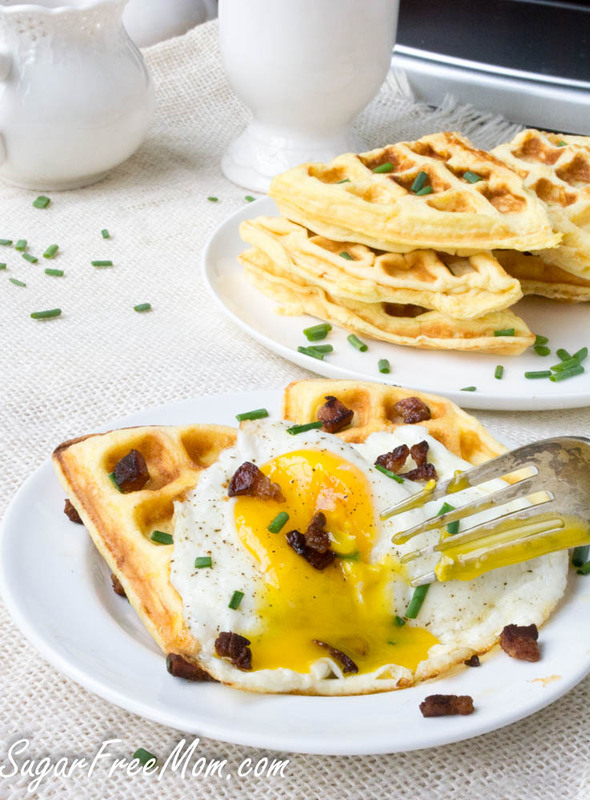 Topping these scrumptious waffles with an egg and bacon is of course totally optional and may not be part of your typical work week kind of breakfast, but when you have some extra time, totally worth it! 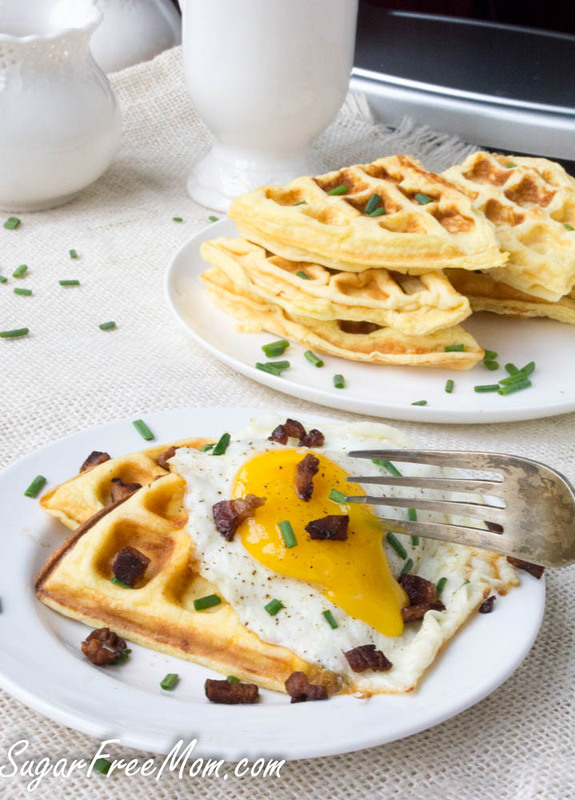 Make these Easy Keto Cloud Bread Waffles on the weekend for the busy week ahead! 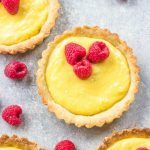 They’re light and fluffy and practically zero carbs! No grains, no gluten and all good. 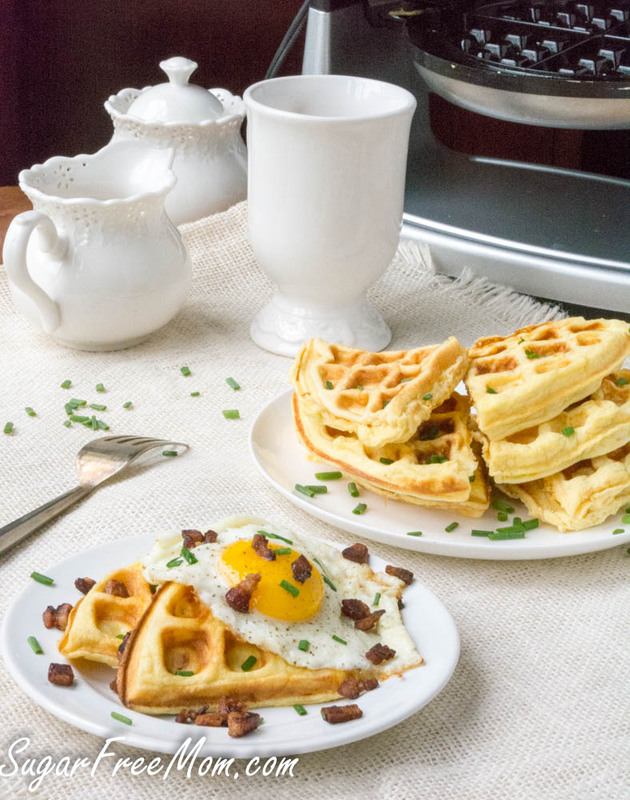 Whether you’re watching your carbs or not, you can’t deny waffles are comfort food. Why not enjoy them with a little bit of savory for a change if you’ve never had them. The addition of shredded cheddar brings out a unique taste and one that you’ll want again and again. You could also make these without the cheddar, no worries if you’re not a fan. 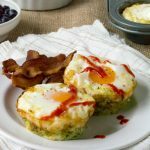 But paired with bacon and eggs and that cheddar is what takes each bite over the top, especially with an oozing yolk! Cloud Bread Waffles Kid Approved! My kids weren’t sure what to think about cheddar waffles, but one taste and they were sold on them. 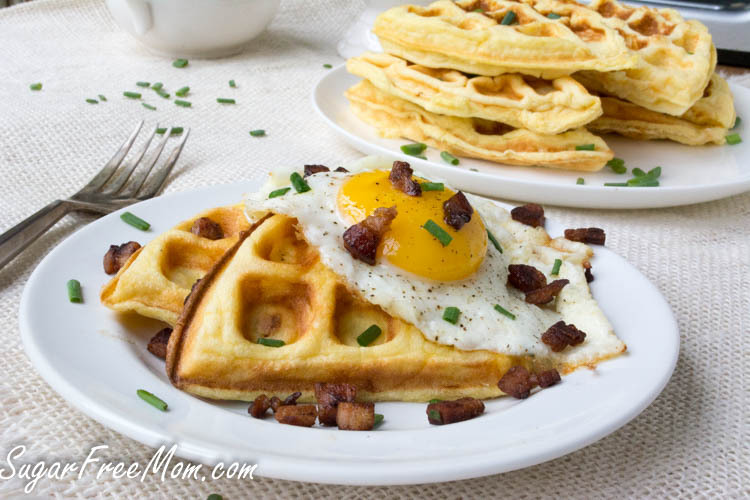 The picky hubby was all over these and soaked up all that oozy yolk with the waffles. He’s been asking when I’ll be making them again. Like I said, making ahead is the key here and having these ready for the family to help themselves on busy mornings during the week is how to make life less stressful, at least in my book. Whisk together or use stand mixer to blend all ingredients together until well combined. My Belgian waffle iron has a scooper it came with and is about 1/2 cup. Just make sure to cover the waffle iron with batter, use a spoon to fill batter all over if needed. Follow your manufacturer's instructions for cooking waffles. Remove once browned and enjoy! Top with crispy bacon or pancetta, an egg and some fresh chives! This recipe makes 4 large Belgian Waffles. Each waffle has 4 wedges. The serving is for half of the whole waffle or 2 wedges out of 4. My previous cloud bread recipes all whip the egg whites and fold them into the remaining batter. With this recipe it is not necessary to do so. The batter will be very thin, but don't worry! It works perfectly and plumps up once on the heat in the waffle iron. Saves time and uses less equipment so less cleaning too! 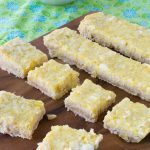 You can make these sweet by eliminating the cheddar and adding about 1/4 cup of your favorite sugar free sweetener. I used plain whey protein powder. Make Ahead Storage: Once cooked and cooled completely store in a ziploc gallon bag in the fridge or an airtight container. Reheat in toaster oven for best results. You are so good with cloud bread recipes! Hi Brenda! I so want to make these waffles; however, I only have vanilla flavored protein powder. Do you think that would work? Well it would work but sweet isn’t the flavor you really want nor vanilla in these with the cheddar cheese. I’d wait until you can get some plain whey protein powder or skip the cheddar and just make these sweet. Add some cinnamon and vanilla stevia and try that instead. OMG! I can’t wait to try this! My oven isn’t working so I haven’t been able to make the cloud bread. This looks great! These look delicious! 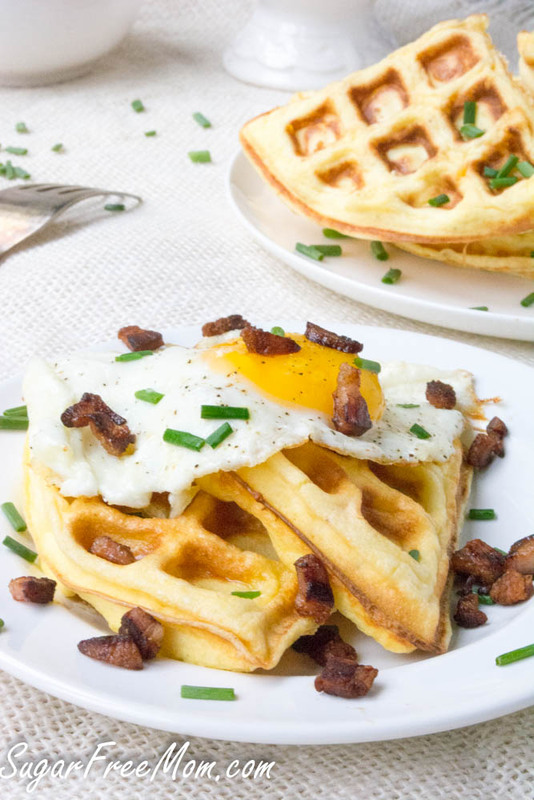 I love the idea of savory low carb waffles. I don’t have a waffle iron, but do have the red copper skillet. Can they be made like pancakes? I’m not sure as I haven’t tried, so let me know if you do and how they turn out. Just curious, BettyLou, if you tried making these as pancakes and, if so, how did they turn out… ? I’ve had a waffle iron in my ‘Save for later’ list on Amazon, but haven’t had the extra money to buy it yet. Thanks! do you think I can substitute ground flax? I don’t have protein powder. could you sub it with either collagen or gelatin too? I’ve just not tried any other subs so not sure. 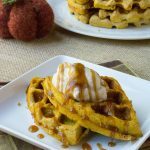 Can you leave out the cheddar cheese to make regular waffles with sugar free syrup when you want that sweet waffle treat without the carbs? 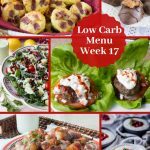 I’m so glad I found your site because I am just now starting keto and thought Id have to give up bread. This will also help my husband do it too because his biggest complaint is the ease of having a sandwich for lunch. In his job he isn’t always near a microwave to reheat food to eat. I think that would be fine to leave it out. Do you have to use the whey protein powder? It does make a difference in the texture. 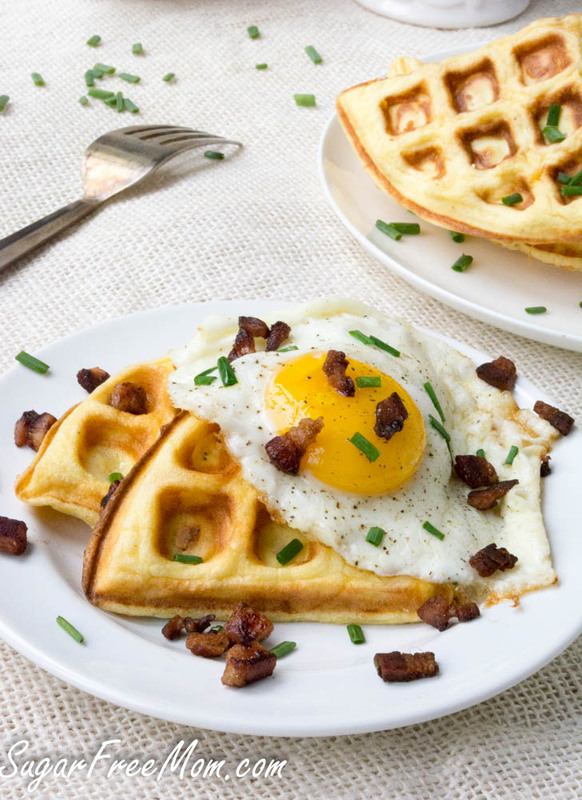 I just made these exactly as the recipe states topped with the egg, bacon and chives. These are so yummy! Super easy and the clean up is easy as well! I will be making these again! 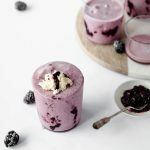 Want to try making these this morning but only have egg white protein powder ? Do you think that would work instead of whey? Yes I do think that will be fine. Hi Brenda! 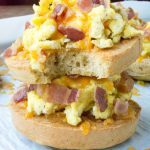 New to keto – about a month in – and was about to lose my mind for something Bread-like when I found your cloud bread recipe and blog. Just made these waffles tonight for the whole family, using plain whey protein instead of vanilla. Topped them with 1 1/2 slices of lox, a slice of perfect summer tomato, a couple of pieces of red onion, some capers, a poached egg, and hollandaise with a sprinkle of cayenne on top. Everybody loved it! 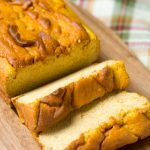 Thank you SO MUCH for this clever and versatile recipe! I’m envisioning fried chicken and waffles next. Do you know if there’s a keto-friendly maple syrup substitute that tastes anywhere close to the real thing? What about sugar-free jams – are they worth trying or should I just purée some raspberries and add xanthan gum to thicken? I have a weird reaction to regular eggs, but I can somehow do cloud bread. Except that I’m an unskilled baker and my cloud bread is usually flat. I’m excited to try cooking it this way! I’m going to use my mini waffle maker. Healthy eggos! I made these last night and accidently used strawberry flavored whey protein powder.. added 2 packets of stevia to the batter and cooked in my Belgian waffle maker. THEY WERE PERFECT! (topped with a bit of Ghee) We had breakfast for dinner bacon eggs and guac! Thank you!! 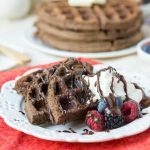 easiest and most authentic waffles for keto!